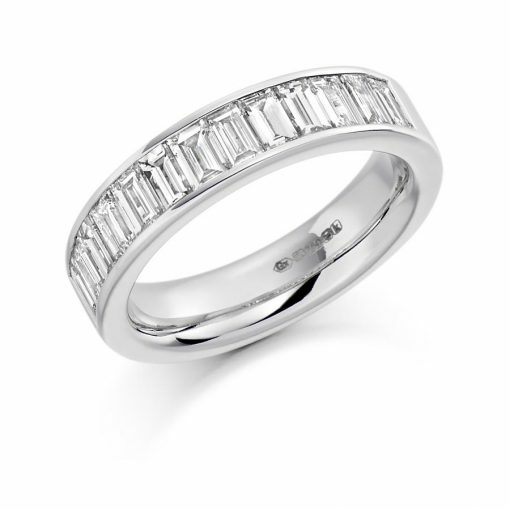 An elegant eternity ring channel set with baguette cut diamonds. This ring is 4.80mm wide and contains a total carat weight of 1.50ct diamonds. A beautiful choice for a wedding ring or as a ring to be worn on your right hand instead. This ring is available in different widths and can also be made with horizontally set baguettes instead if preferred. It can be made in 18k white, rose, or yellow gold, and platinum. Call us today to book your appointment to view this and other similar styles. Perhaps it is for a wedding ring, eternity ring, anniversary gift, or just a treat for yourself!